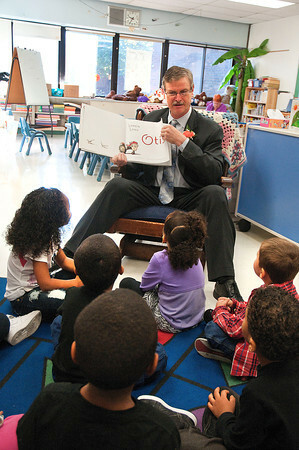 James Neiss/staff photographerNiagara Falls, NY - At 9:30 a.m. Mayor Paul Dyster began reading "Otis," in Kristen Grandinetti's Pre-K class at Harry F. Abate Elementary School, as part of a world record event. Jumpstart’s Read for the Record, in partnership with the Pearson Foundation, is a world-record-breaking campaign that brings together children and adults to read the same book on the same day. The selected book for Thursday’s event is “Otis,” authored by New York Times bestselling author Loren Long.